Peppermint Essential Oil (Mentha Arvensis) - Sweetgrass&Rain Inc. There are several species of the Mentha Arvensis, a perennial herb that can grow to 3 feet in height. It has hairy leaves with serrated edges and spiked purple flowers, and spreads by way of its underground runners. It is one of the oldest documented medicinal herbs. 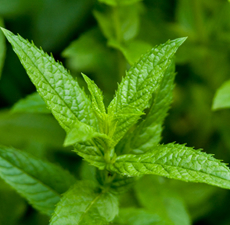 Peppermint Japanese is known for its high menthol content, and menthol crystals sometimes form right on the leaves. Peppermint's name has its roots in Greek mythology. Hades, god of the dead, pursued the beautiful nymphe, Minthe. Hades' wife, Persephone, became jealous and turned Minthe into a small and insignificant plant on which to be trampled. Pluto could not undo the transformation, but ensured that Minthe would always be loved for her fragrant aroma.